Rich in water content and potassium, this brinjal is an excellent cholesterol regulator and is a good dietary fiber. It is good for digestion, diabetes management, weight loss and heart health. 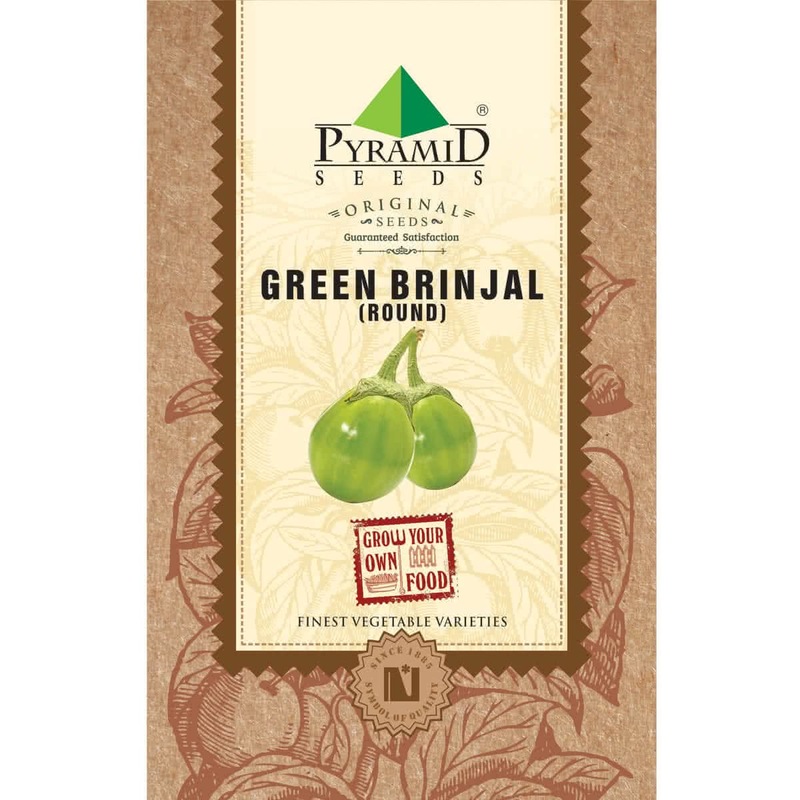 Green round brinjals are good to control acidity. Introduction and Uses: Brinjal belongs to the nightshade family. It is rich in fiber, potassium, vitamin B-6 and phytonutrients like flavonoids. The antioxidants in this vegetable keep the arteries healthy and lower the risk of cardiac diseases. The eggplant is high in water content and hence keeps the body hydrated. Sowing Season: Throughout the year. Because the seeds are small, Brinjal plant is grown by transplantation method. Seeds are first sown indoors in seedling trays or outdoors on seed beds. Later the seedlings are transplanted into containers or in raised beds. Sowing container: Seedling trays/ seed cups/ small polybags/ Seed bed. Take a seedling tray with medium sized cells & drainage holes at the bottom. Fill the cells/cups with a moist coco-peat medium. Hold the Brinjal seeds in your left palm & sow 2-3 seeds per cell/cup. Since Brinjal seeds are small, avoid sowing them very deep. Place the seeds on the surface of the medium & push each seed a little inside the medium by using pencil tip, so that seeds are not visible on the surface anymore & cover it with more coco-peat. Or make small, shallow depressions on medium with pencil bottom. Put the seed in that depression & sprinkle more coco-peat on the top to cover the seed. Keep the seedling tray indoors till the seeds germinate. Covering: Keep the seed tray in a box or cover it with paper for first 4-5 days to encourage faster seed germination. Water the seed cells with a spoon in the first week. Provide two tablespoons of water every day. Or keep the seedling tray in another tray full of water for half an hour, so that water will seed cells will absorb the water from the bottom, via drainage holes. If the seed beds are made outdoors, protect them from heavy rain or direct sunlight. Use well sieved fine soil as a sowing medium & make a nice raised bed from it. Cover the bed by making a temporary roof of the plastic sheet. Water it in the form of a light shower by watering can. Sprouting Stage: Seeds will germinate within first 6-8 days or so & tiny sprouts will be visible. Once seeds germinate, put the tray in an open partially sunny spot near the window. Don’t cover the tray anymore. Cotyledons: The early two leaves will emerge from the second week of germination. These are false leaves called as cotyledons. First leaves: First leaves will emerge above cotyledons at the end of the second week. These are Brinjal's original compound leaves. Seedling stage: Second week onwards, seedlings will start growing into a small plant. At this stage, exposé the seedlings to more & more sunlight for leaf growth. Thinning: After the second week, keep only single seedling per cell/cup. Cut off the weak, small & lagging seedlings with a pair of scissors. Four weeks after the seed sowing, your seedlings will be ready to transplant in container pots or raised beds. Ideal planting mixture for Brinjal: 2 part garden soil & 1 part organic manure. Or 1 part garden soil, 1 part coco-peat & 1 part Vermicompost. Transplant the seedling along with root ball of a medium, without disturbing its roots. Unlike other plants, Brinjal seedlings can be transplanted deeper into the soil, so that little portion of the lower stem & leaves can be buried inside. This encourages more root formation. Spacing: Plant the seedlings minimum 2 feet apart (60x60 or 60x45 cm) from each other on raised beds. Plant only single seedling at the centre of a single regular 8-12 inch pot. Sunlight: Brinjal plants require full sunlight in winter & partial sunlight in summer. Therefore, place your raised beds & potted plants according to the season. Watering: Water your potted Brinjal plant every day in summer & every other day in winter. Water at the soil near the plant. Use a watering can and make sure that the plants get water in the form of a shower & not by a single flow. You can also make provision for watering by drip irrigation system for your raised beds. Avoid overwatering. Manuring: Add good quality organic manure in the soil with 2:1 ratio before transplanting the seedling. Organic fertilizer can be well rotten cow dung manure, farmyard manure, compost or vermicompost. Plant care: Always look for the early signs of any insect/fungal infection/ any other infections. Spray appropriate medicines as soon as any symptoms of such diseases are spotted. Support: Support your Brinjal plant by tying its main stem to a single erect stick buried in the soil near the plant. With this support, your plant will stay upright. Pinching/Topping: Pinch out the apical (top) growing point of Brinjal plant when its two months old to encourage new and uniform side growth. This will increase the brinjal production. Also, pinch off any diseased leaves & branches immediately. 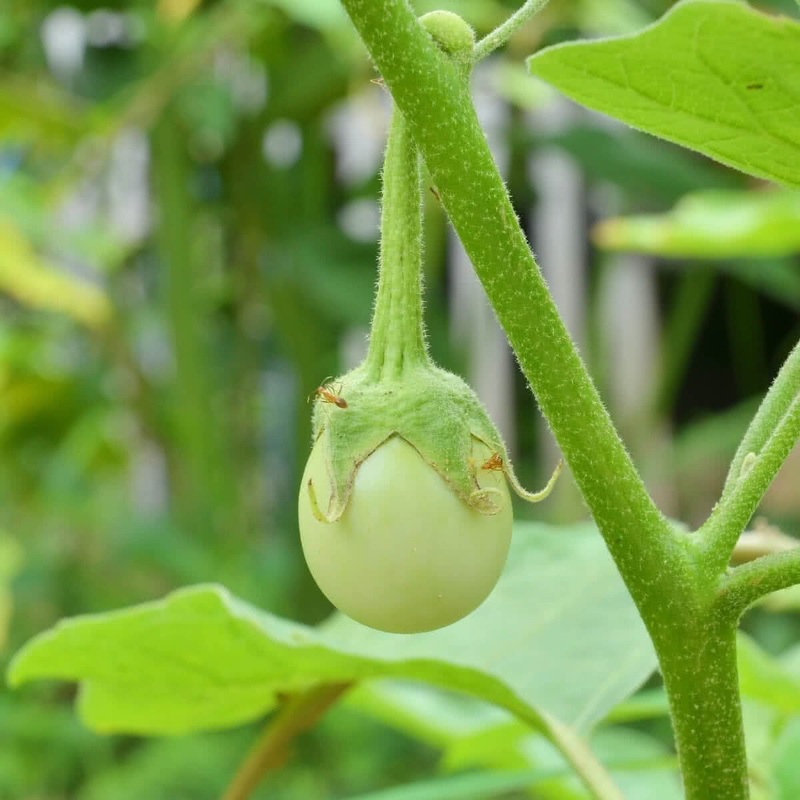 Harvesting: Brinjal plant will start flowering at the end of 3rd month. Brinjals can be harvested 70 to 80 days from the sowing of seeds. If proper care is taken, Brinjal plant will continue to grow & produce veggies for three years. Approx. 180 to 200 seeds in 800 mg, 5625 to 6250 seeds in 25 gm, 22500 to 25000 seeds in 100 gm.